SPECTREOUTREACH.com: Dooodoll Giveway From Malay Mail! 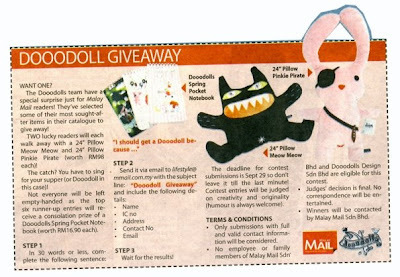 Dooodoll Giveway From Malay Mail! Just receive a email from Malay Mail yesterday and I found out I the one of the two lucky grand prize winner. Cool ^^! ( No. They are local based company at Kota Damansara PJ , not made in China company) Dooodolls are really awesome and breath taking especially in the 24' sizes . For more info. check out their websites here.